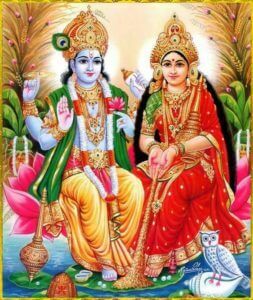 Mother Lakshmi is the source and provider of the enumerated well-known sixteen types of wealth and many more.Her Stotras should be chanted for prosperity. 1.1: (Harih Om. O Jatavedo, Invoke for me that Lakshmi) Who is of Golden Complexion, Beautiful and Adorned with Gold and Silver Garlands. 5.2: I take Refuge at Her Feet, Who Abides in the Lotus; By Her Grace, let the Alakshmi (in the form of Evil, Distress, and Poverty) within and without be Destroyed. 6.2: Let the Fruit of That Tree of Tapas Drive Away the Delusion and Ignorance Within and the Alakshmi (in the form of Evil, Distress, and Poverty) Outside.